The KX12DQ-WE combines the excellent performance of the KX digital quad technology with the benefits of a wireless product. 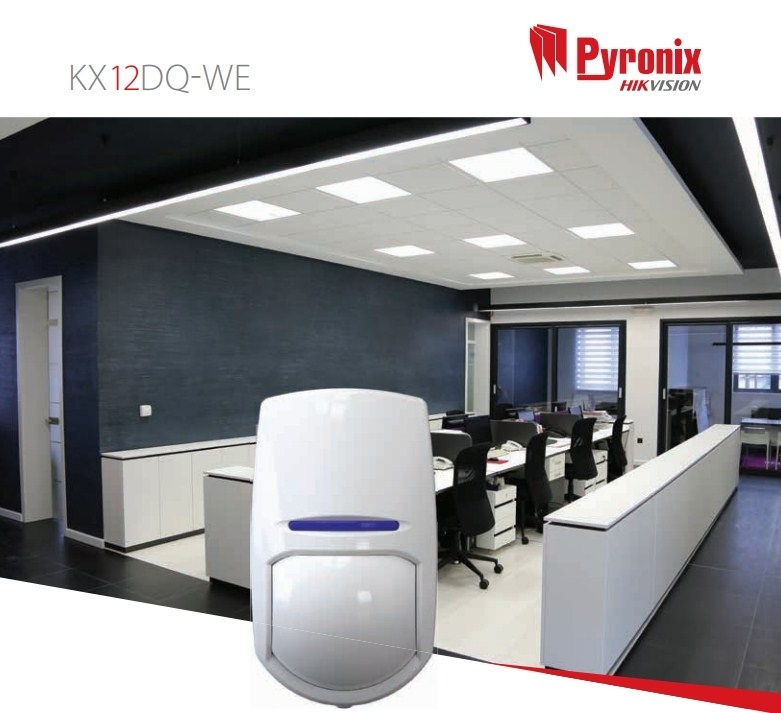 With increased accuracy and sensitivity the KX DQ sensor is the ideal choice for many homes and businesses alike. In the KX Series, the distance between the pyro-electric sensor and the lens is identical for each detection zone. This eliminates distortion and provides excellent focused zones. In traditional detectors the lens is made in a flat form and bent into a cylinder. Therefore the distance between the pyro-electric sensor and the lens varies for each detection zone. This causes distortion and unfocused zones, reducing reliability. All Enforcer 868MHz High Security Peripherals are compatible with the Enforcer control panel, and Euro panels fitted with the EURO-ZEM32-WE wireless zone expander. 12m Wireless Volumetric detector 12m Volumetric detection coverage. Ideal for protection of rooms, offices etc. When the product is used in a hot environment this technology digitally adjusts the detector’s sensitivity allowing it to maintain its range even when the background room temperature is almost equal to the external body temperature of 32ºC (internal body temperature = 37ºC). This technology further enhances the detector’s immunity to infra-red noise in the environment. BWT comprises of 2 key components: 1). The new 3D optics system enables perfect focussing of the infra-red signal onto the pyro-electric sensor. This allows BWT to clearly identify the positive and negative signal edges. 2). Powerful software embedded into a microprocessor is used to process the received information from the pyro-electric sensor. The result of this combination is lower infra-red signal noise amplification and therefore better immunity.